Irons' last game was a defeat (3-1?) at Stark's. 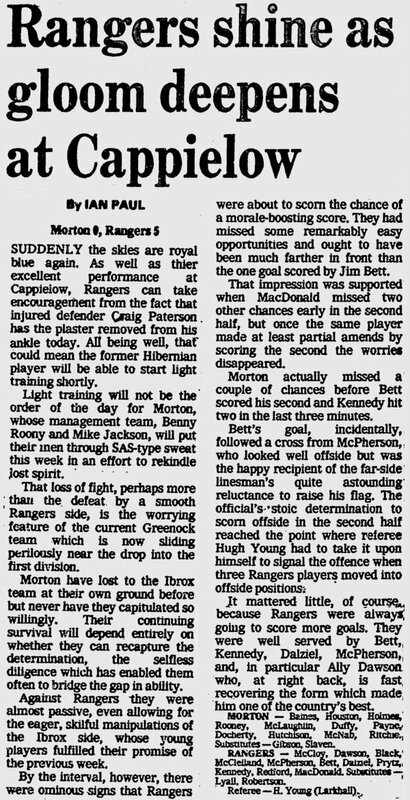 Donkey Dave was punted after a 1-1 draw at Hampden (the one with the red-stripe haired QP fan in the Ton end). 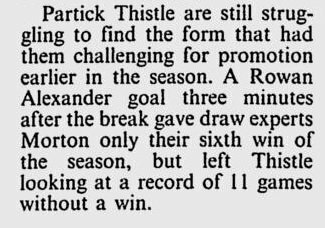 His replacement was Cowboy, whom we took from QP, was shown the door after a 2-0 defeat at Ayr, with Joe McLaughlin's interim management ending after a 1-0 defeat at Stair Park. 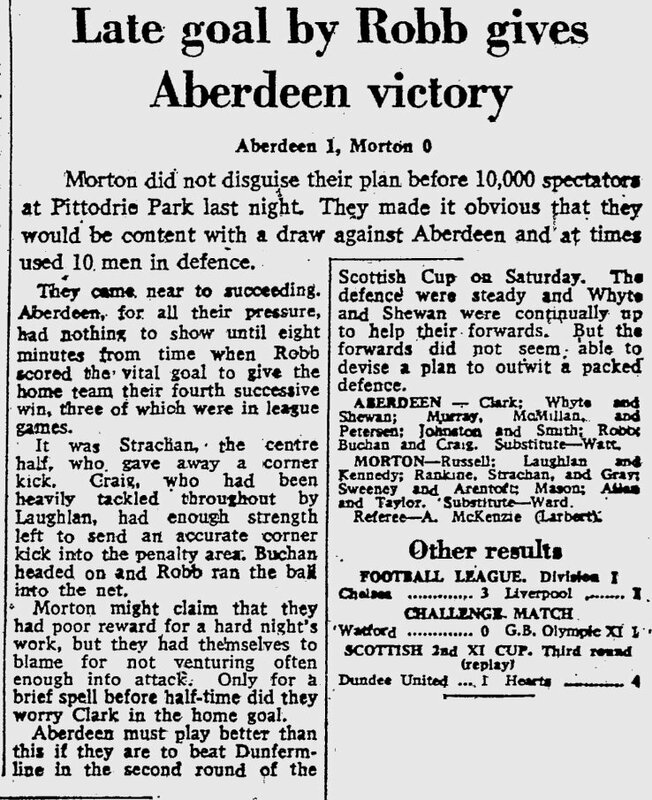 As mentioned by JB - Moore left after a 5-1 defeat by Livi. 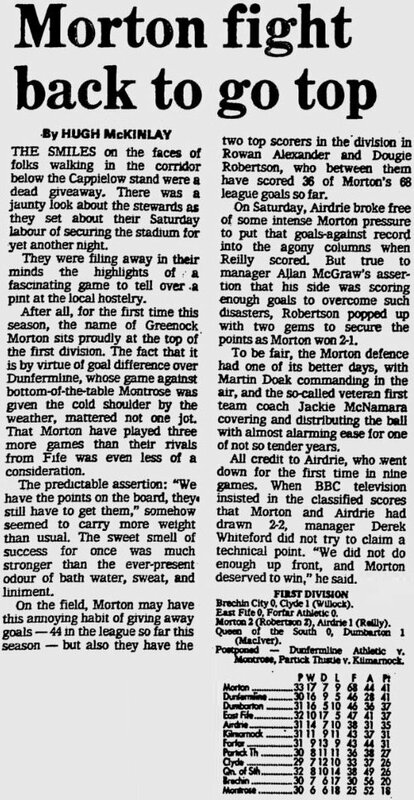 Davie Hopkin managed for three whole games after this, managing one goal for and eight against, technically the worst record of any Morton manager (not counting the single game defeats under the likes of Collins or Clark). 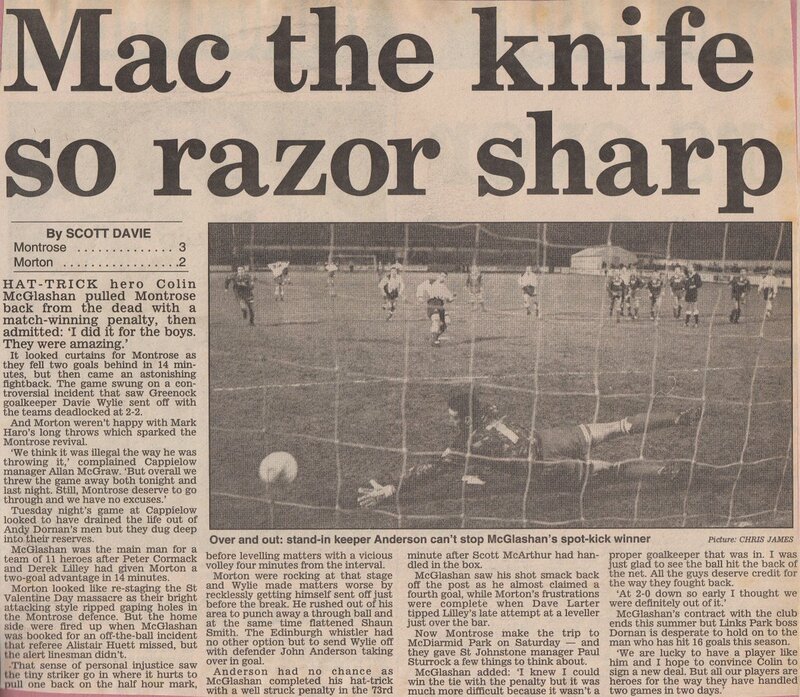 Ian McCall was locked out at the end of a season as part of a budget saving exercise by HS. 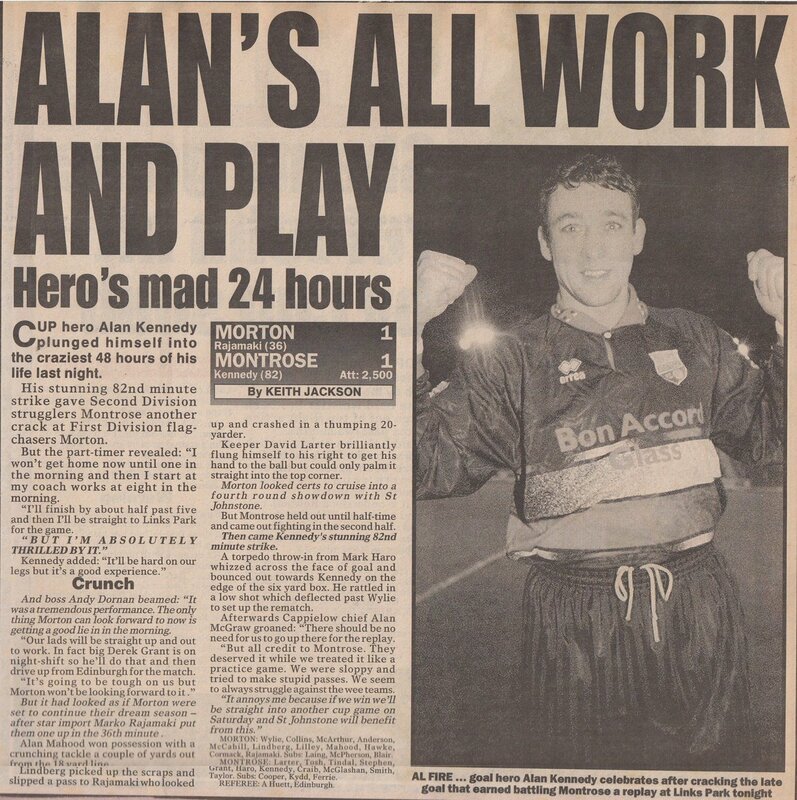 Team: McFeat, Whyte, Fyfe, Aird, Blair, Campbell, Adams, Garth, Crum, Kelly, McInnes. 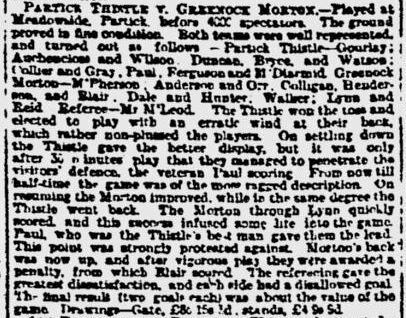 Morton played towards Port Glasgow in the first half. Weather snowing throughout, except at half-time and towards the end of the match. A Kelly run and lob onto the top of the Rangers goal-netting is the first incident of note. 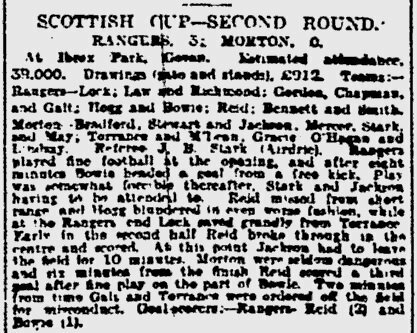 Three Rangers raids were neatly halted by Blair, before Venters sends a shot just past McFeat’s right post. Whyte’s grounding of Venters lets Symon send a free to Waddell who at a second try gives to Duncanson who homes easily at the low right corner on six minutes. 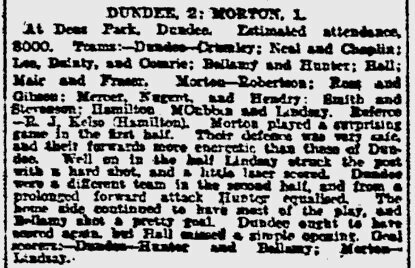 Soon after, Duncanson misses another easy chance, and Morton take advantage of the miss. On twelve minutes, a lob by Aird was just palmed out by Jenkins in the Rangers goal, but only as far as McINNES who confidently raced in to wham the ball home between Gray and Shaw, who were attempting to cover up - Gray’s dive to head away being unsuccessful. 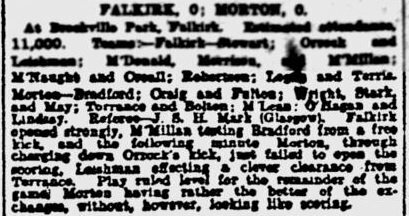 McFeat was then in action against McCormack, stopping two shots, and a nice shot by Kelly was deflected by a defender towards the low left corner, but Rangers’ ‘keeper Jenkins manages to palm away for a corner. 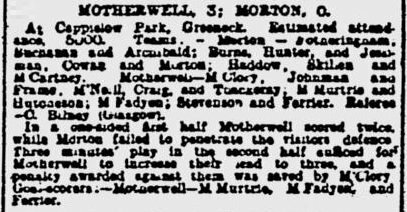 Venters then gets possession from Duncanson, and a cross-shot easily beats McFeat to restore the lead for the visitors. Garth goes off after being tackled by Symon, but soon returns to the field. 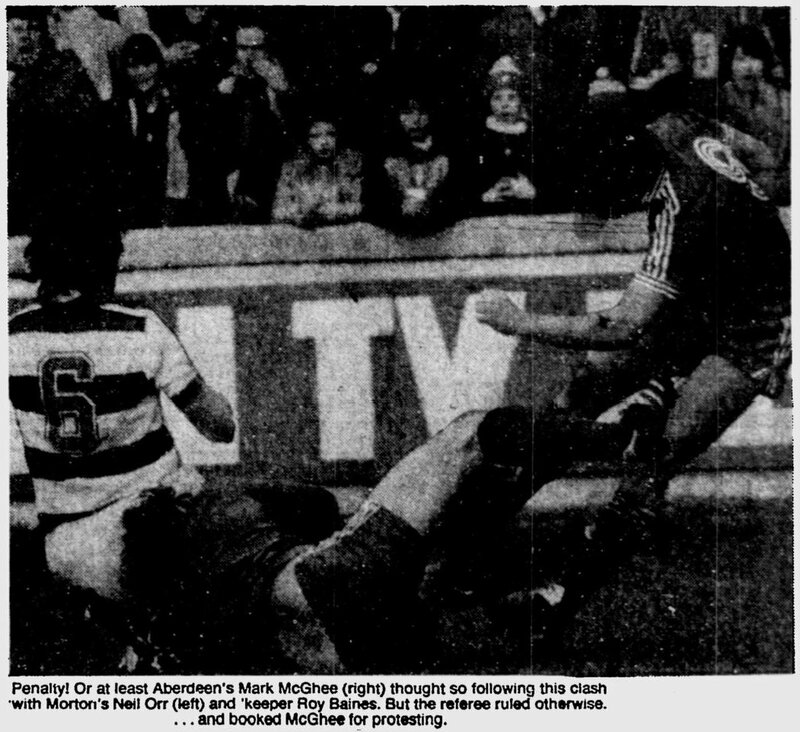 McInnes tries to backheel a Garth try into the net but Rangers’ defender Young was on the line at the right post to clear. Venters then has another shot that flies narrowly past the right post. Numerous injuries and sporadic long shots marked the remainder of the half, with Campbell going close with one shot that was cleared from just under the bar. 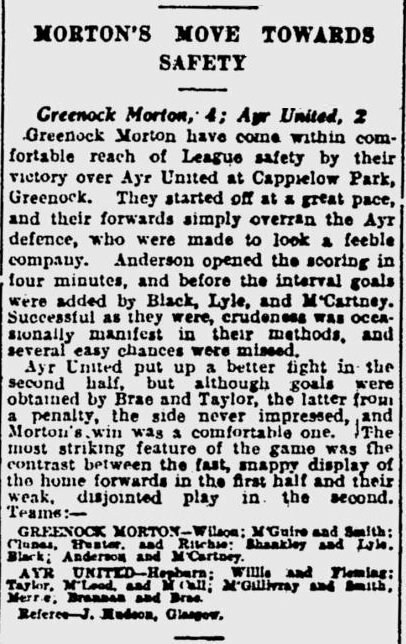 A constructive Waddell pass to Duncanson allowed the latter to break through two Morton defenders, but he was just dispossessed in time by Whyte with a clean two-footed tackle. 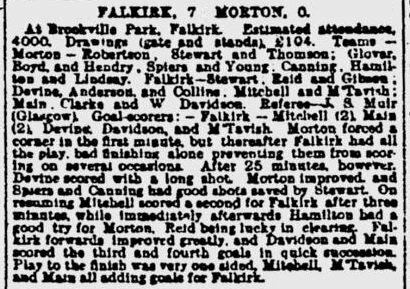 Gillick then put Waddell through on a neat break, narrowly beating the offside flag, and he homed strongly from a very narrow angle to the right of the Morton goal. A free kick by Aird near the right corner flag came down on top of the Rangers crossbar and goalkeeper Jenkins commendably pushed it back over the bar to concede only a corner. 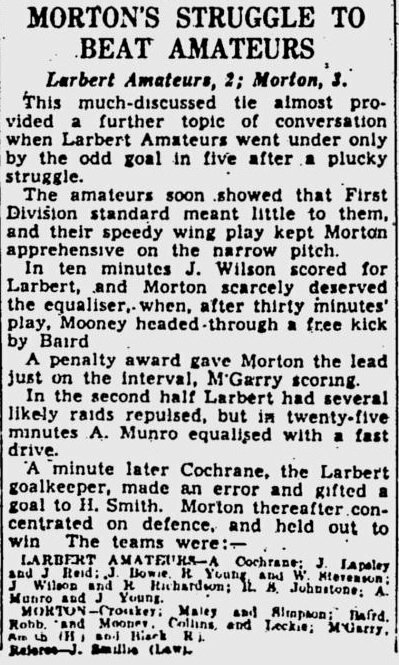 After the resulting unsuccessful Adams corner, Garth had a nice cross to the goalmouth where Crum was well covered, his header going wide to the right of the Rangers’ goal. 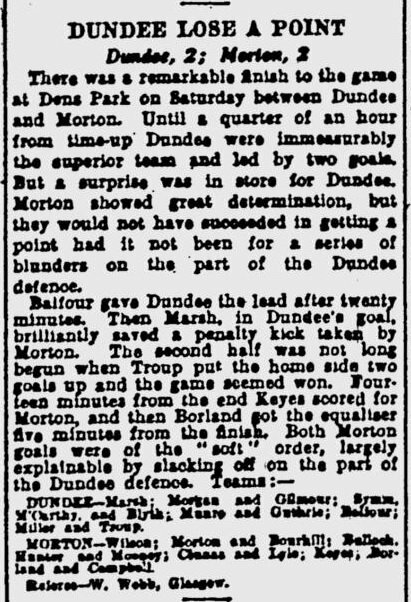 Fouls were very frequent with several injuries, and Whyte was sent off late on for persistent fouling, before Duncanson added a fourth goal for Rangers, prodding home from close range just before the final whistle. Referee: C.R. 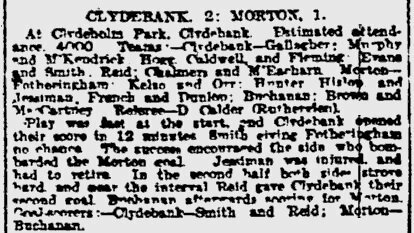 Blues of Glasgow – youngest ref so far seen and no improvement on the older yins. Had tough assignment. Scottish Cup. The draw gave us Celtic away in the Quarter Final. Scottish Cup. From 3-0 up with 16 minutes to go. Scottish Southern League. Cheers to torontobee for the scorer - the paper made no mention of it. Edited by AyrshireTon, 10 February 2019 - 07:01 PM. Scottish Regional League - Western Division. I've been out drinking many years ago with the QP fan in question, actually a nice guy, if a bit mercurial. 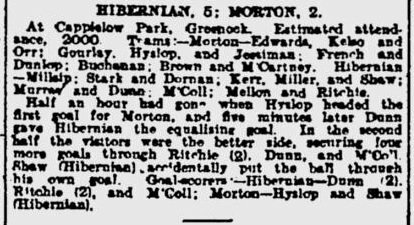 But I remember that game because Craig Coyle was doing his best Gordon Banks impression while McPherson stood motionless, arms crossed, on the touchline. It was 1-1 going on 10-1. Edited by AyrshireTon, 17 February 2019 - 09:50 PM. Scottish Cup replay. The draw gave us Raith Rovers away. 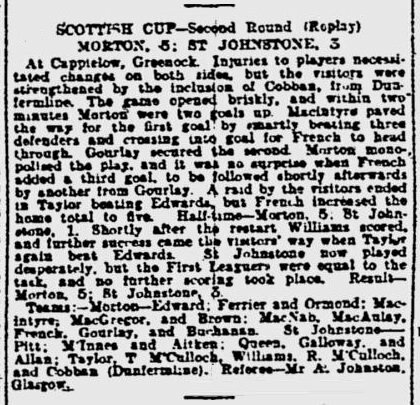 Scottish Cup replay. Apologies for the quality. 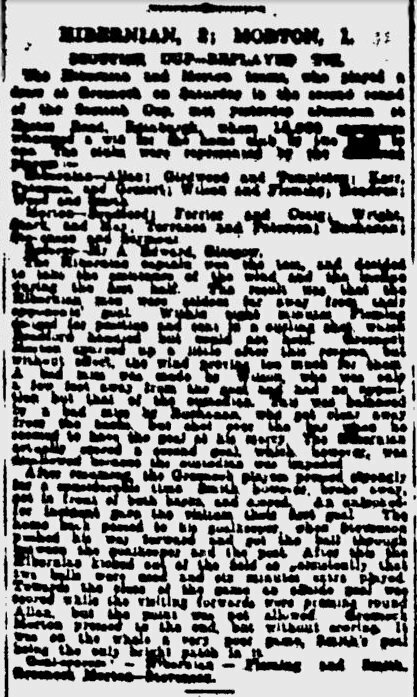 Mired in a tough spell during the 1944/45 season – a number of first team players on active service overseas and therefore unable to play for the team. 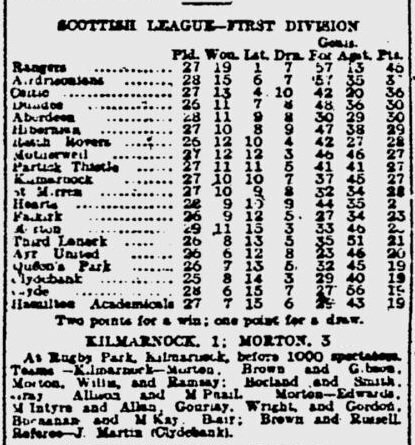 During the war years, Rangers won every Southern League competition. 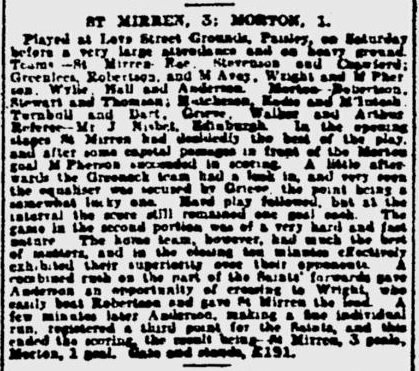 I read an article recently which explained that whilst most clubs lost players to active service, the majority of the Rangers team managed to arrange jobs in the shipyards for the duration of the war. Might just explain their dominance. 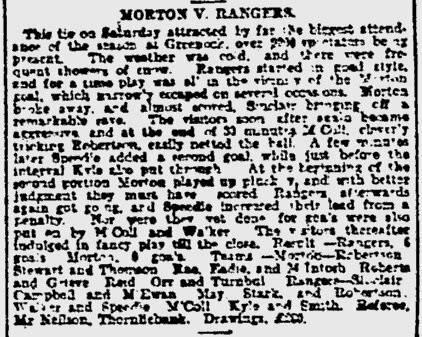 During the first world war, Rangers and Morton gained most from shipbuilding being a reserved industry. We did seem to peak in the 1910s. Wow, they were certainly fortunate if that was the case. For sure at that time, Tommy Orr was a lieutenant with the Royal Artillery serving in Burma, Jimmy Cowan was serving with the Scots Guards in Denmark (among other places) and Billy Steel was in France with the Royal Signal Corps. Other regulars were also missing, like defender Matt Maley. 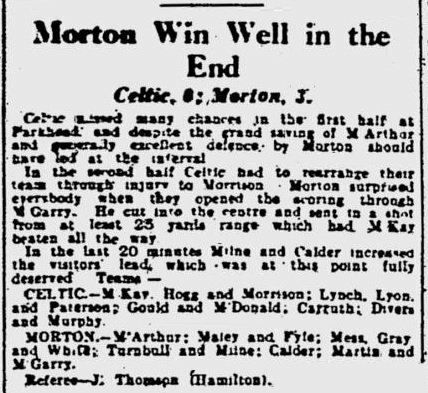 So sad that all those Morton greats played together so few times. What a team they would have been, if they had been able to stay together. Edited by torontobee, 12 February 2019 - 03:22 AM. 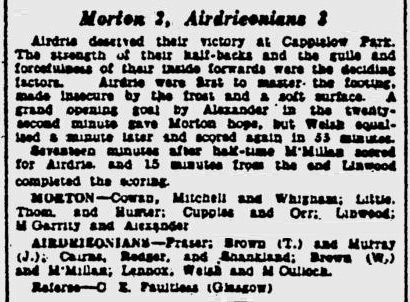 John Anderson's late equaliser was his first goal for Morton. Scottish Cup. The draw gave us Ayr United at home. Scottish Cup. David Wylie returns to Cappielow as Clyde's keeper. The draw gave us Celtic at home. Scottish Cup. After a couple of postponements, this was played on the Tuesday before the next round of the cup. The replay would be played the following night. Scottish Cup. The draw gave us Hamilton away. Scottish Cup. 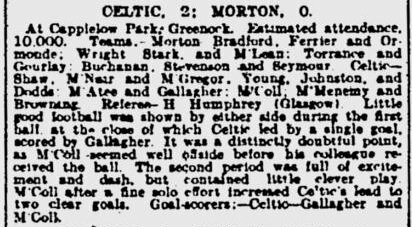 This followed a 2-0 win in this tie on January 23rd, which was then declared void. Edited by AyrshireTon, 17 February 2019 - 09:46 PM. Scottish Cup replay. From 2-0 up. With Wylie receiving a straight red in this, he'd miss the next game (Dumbarton at home). This led to a frantic effort to locate Andre Boe in time for Saturday. Scottish Cup. 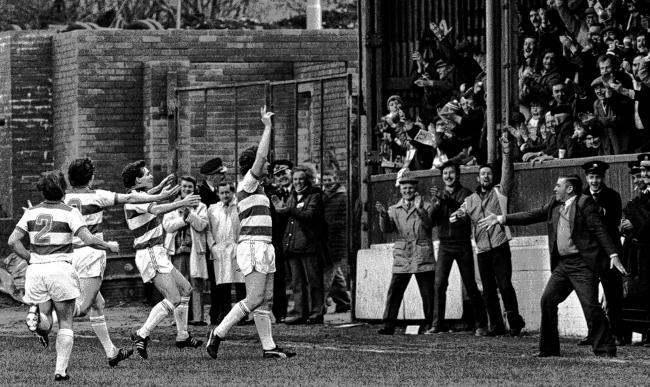 Clydebank at home in the Quarter Finals. Enough said.